Masking is a tedious but required part of powder coating. Masking powder coat is done for either appearance or for function and both of these topics will be explained more in-depth in this article. I will also discuss some of the more basic, but important, powder coating masking materials and supplies. Don't forget to check out Masking Part II and the Wall-Mounted High Temp Tape Dispenser. When powder coating, it is important to mask off certain areas of certain things. Powder coating is a thicker coating than most paints and if you don't mask certain areas, things might not go back together when you're done. You can also use masking techniques to make designs, logos, and words on the things you are powder coating for a different look. Masking techniques and supplies are not all standardized, sometimes you have to get creative to mask off certain items. Again, this will be one of several articles on masking, so I will cover the basics of masking here. This alternator case is masked with Polyester Powder Coating Tape. This tape can withstand 400 degrees without degrading. Masking can give a powder coated item many different appearances. Let's use wheels as an example. 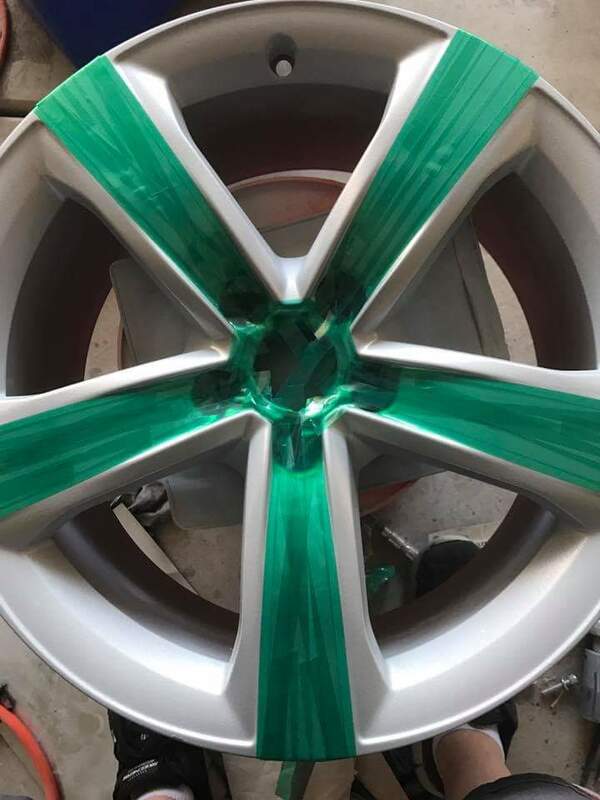 It is popular to powder coat the lip of the wheel in one color, and the spokes of the wheel in a different color. How does masking come into play to get this two-tone look? By coating the wheel in one color, masking off the areas you want to stay that color, and then coating the exposed areas in another color. You then have two tone wheels that wouldn't have been possible without masking. The alternator case above has a recessed hole in the middle. That hole was masked because, when assembled, a bearing fits into it. The bearing fits into the hole so tight, that had it not been masked, the bearing would no longer fit. This is something you need consider before powder coating. When powder coating automotive parts especially, there are many assemblies that fit with very tight tolerances. You can see another example with this brake caliper down below. The 2 large holes were masked off from the powder coat so the caliper pistons would still be able to fit inside. Caliper Piston bores free of powder coating to allow proper piston function. Other tight tolerance areas are bolt holes. When a bolt hole is powder coated, it can cause a lot of difficulty with threading the bolt in. If the bolt will not thread into the powder coated hole, the hole must be cleaned of powder coat with a thread chaser or tap. A thread chaser cleans and straightens the threads but does not cut into the metal like a tap does. I recommend a thread chaser but they are not near as common as taps and impossible to find locally. Thread chasers are a good tool to have in the garage regardless of powder coating. This is often overlooked when powder coating. There are some parts, such as starters and alternators, that receive their ground not from a wire, but from being bolted to the engine, which then, is connected to the battery via a ground or negative wire. In the case of an alternator, your engine serves as the wire to connect it to the battery. From the factory, the alternator, the alternator bracket, and the spot on the engine where the alternator bracket bolts to, will all have a bare metal surface to allow the electrical connection. Powder coating serves as an electrical insulator: it does not conduct electricity. Say you powder coat the alternator without masking off anything. The alternator will now be insulated from the alternator bracket and will no longer serve to charge the battery. 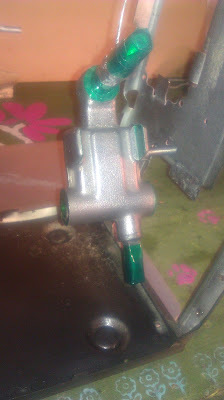 This is the same with the starter, if it is powder coated entirely, the car will no longer start, because the connection is blocked. The alternator pictured connects to a alternator bracket in 3 places, all 3 of those places were masked so they remain bare metal. The alternator bracket was also masked in those 3 locations. You must keep that in mind before power coating. Before you even remove a part, take note of how it mounts and take care to mask those mounts accordingly. It's not just the starters and alternators. Lots of sensors are grounded through their threaded bodies. Meaning when the sensor threads into a metal bracket, that is how it connects to the ground. 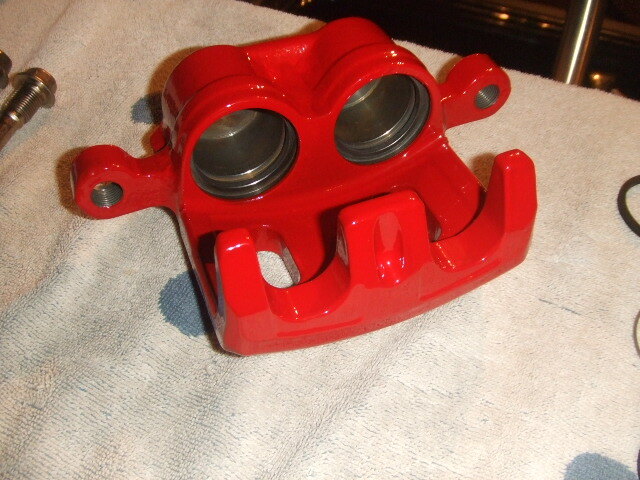 If you are powder coating the bracket, make sure to mask the threads and the brackets mounts. By structural mating surfaces, I mean, where 2 critical components meet and there should be metal to metal contact. 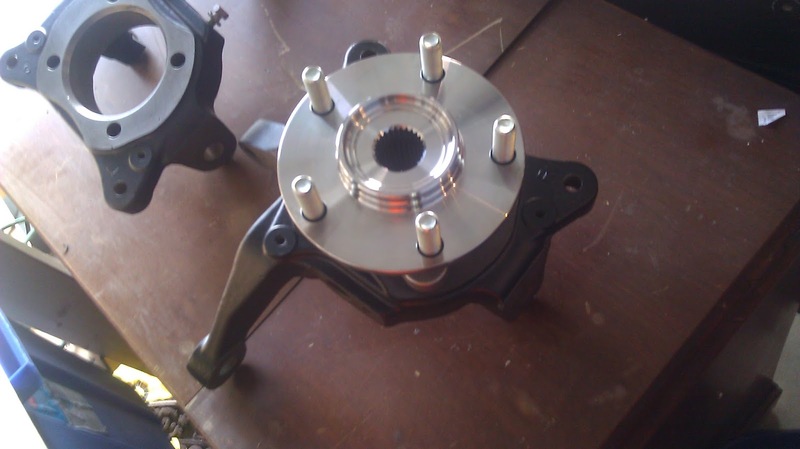 This includes wheel hubs, brake caliper mounting points, suspension mounting points, etc. There is some debate on whether a layer of powder coat has an effect on anything, but I look at it this way: Those areas are usually bare metal from the manufacturer. When you buy brand new wheels, the wheel hubs are left in bare metal from the manufacturer. I choose to follow the manufacturers choices here as they are the ones with the engineers. If two parts are mounted together using grade 8 or higher bolts, the specification is that where those two parts meet, must be bare metal. The mating surface of of this steering knuckle masked. The mating surface left in bare metal where the wheel spindle mounts to the steering knuckle. Gasket surfaces should also be masked off before powder coating. Anything that uses a gasket to contain fluids fits in this category: valve covers, oil pans, water pumps, oil pumps, oil filter housings, etc. Not masking these surfaces increases the chances of leaks. 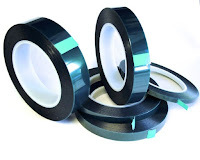 High temperature polyester tape is the most common masking solution for powder coating. It can withstand sustained temperatures above 400 degrees without turning into goo like normal tape would. Do not use any type of normal household tape for a full-length oven cure. It will melt into the powder and turn into a mess, usually resulting in stripping and redoing the part. The high temp tape can be a little hard to work with as it is not flexible like masking tape is. But the tape is still a necessity for powder coating. It does cut easily and it does leave clean lines. I personally use and recommend a roll of 1/2 width and 1" width tape. With those 2 sizes, you can mask smaller areas and larger areas without spending a lot of time. However, it is helpful to have different sizes for different situations. Check out the available tape sizes below. Another type of tape to be aware of are these high-temp tape dots. These are a life saver in some situations. Before finding them, I used to trace various sized sockets onto a piece of tape to give me the size I needed, and then cut it out with scissors. That's when I found out cutting out a perfect circle free-hand is near impossible. These dots come in various sizes but I have not been able to find an assortment pack at this point, so I just order them on an as-needed basis. Just keep them in mind if you find yourself needing to mask perfect circles. 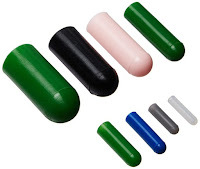 Silicone plugs are cone shaped pieces of silicone that fit into various sized holes. They are perfect for masking off bolt holes. Because they are tapered like a cone, each one fits a few different sized holes. They are re-usable and do not degrade at all in the oven. It it ideal to buy a couple of various kits so you have a variety of different sizes on hand. If you are in search of more specialized plugs, check out Epsi.com They have the largest assortment of masking supplies I have seen. They will send you a text-book sized catalog for free if you call and request it. Silicone Plugs were used to mask this coil pack bracket. There are many different kinds of specialty plugs out there but a few are really helpful when powder coating common items. 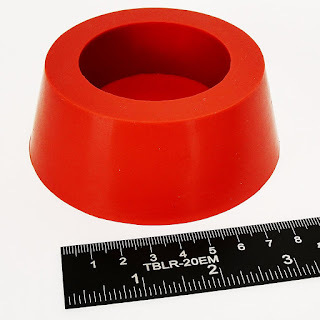 The red plug below specifically fits 30 oz stainless steel tumblers such as Yeti cups. When powder coating brake calipers, the caliper piston bore needs to be masked off to prevent sandblasting media and powder from getting inside which can affect the polished finish and ruin the brake caliper. The easiest way to mask off the caliper piston bores is with a silicone plug. Most calipers have different side piston bores so it is best to measure your caliper pistons bores with a caliper tool or ruler to make sure you order the right size. The range of silicone plug sizes below should fit almost any caliper. 23.012mm ⟶ 26.975mm 0.906" ⟶ 1.062"
26.187mm ⟶ 31.750mm 1.031" ⟶ 1.250"
30.150mm ⟶ 36.500mm 1.187" ⟶ 1.437"
33.325mm ⟶ 41.275mm 1.312" ⟶ 1.625"
38.100mm ⟶ 44.450mm 1.500" ⟶ 1.750"
41.275mm ⟶ 50.800mm 1.625" ⟶ 2.000"
47.625mm ⟶ 55.956mm 1.875" ⟶ 2.203"
53.975mm ⟶ 63.500mm 2.125" ⟶ 2.500"
57.937mm ⟶ 68.250mm 2.281" ⟶ 2.687"
Caps are basically the opposite of the plug, they are silicone like the plugs, however they are shaped to go over studs. Normally not used as often as tapered plugs, but they are good to to have if you know that the parts you will be coating do have attached studs, you can see them here. The only time I plug bolt holes when is when the bolt serves as a ground connection between 2 parts or if it's a structural bolt that gets torqued to a specified value. I do not mask off bolt holes or studs that are not for critical parts. For example, I will mask off all threads and mating surfaces of a brake caliper, engine mount, or suspension piece but it is often unnecessary to mask off threads for light-duty things like interior trim. The reason I do that is to allow a thin layer of powder coating in the bolt holes to help protect the threads from corrosion. Any bare metal point on a powder coated piece, can start to rust and I don't like the idea of the rust creeping from the bare metal areas to underneath the powder coated surface. I have found that most bolts thread in with no problem even with a thin layer of powder in the bolt holes. I have found the same to be true for studs. If I ever have issues threading a bolt in, I just run a thread chaser through the hole, like I mentioned above. This cleans out the holes enough for the bolt to go in, but still leaves the threads protected. Just make sure to mask off any important structural bolts or threaded holes. As a general rule, I mask off any bolts and threads that are engine, suspension, or brake related. A nut has no problem tightening onto these powder coated studs, and they are protected from rust. Wear Clean Gloves While Masking! 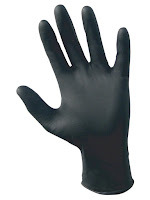 Another essential tool for masking is tight fitting disposable gloves. 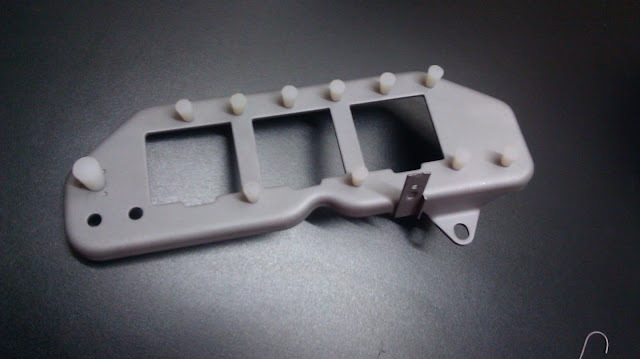 When you are masking your part before powder coating, that means that it should be clean and sand blasted already. After sand blasting, you do not handle the part with bare hands. From the sand blasting cabinet until the part is completed and coming out of the oven, I do not touch the part with my bare hands. Your hands, even when clean, contain oils and salts that can cause issues with the powder coated finish. This is true for paint too. Also, any point where you touch freshly blasted bare metal with your hands, is a spot for rust to start. You can do a little experiment with this to see what I mean. Take a piece of metal and completely degrease it, then blast it clean with a sand blaster (or use a wire brush if you don't have a sandblaster yet). Now that you have the completely clean bare metal part, take your finger and just press it down in one spot. Then just walk away and come back the next day. Unless you live in a very dry climate, you will come back to your exact fingerprint etched in the metal, in the form of rust. This is why it is very important to never touch your cleaned and blasted part with bare hands. It is also important to only use clean gloves. I keep 2 boxes of gloves out in the garage, one box is unused, brand new gloves. After I wear them to handle parts during powder coat preparation, I transfer them to the 2nd box. I wear the gloves from the 2nd box when doing anything else in the garage, like working on the car. There's no reason to throw them away and waste them just because they are no longer fit for powder coating. Like I said, you will want nice, tight fitting gloves. Masking is difficult already, you don't want loose gloves sticking to the tape you are trying to use. I have covered the most basic powder coat masking materials here, there are many more methods and ways to mask, I will explain some more in the next masking post. Just keep this in mind in the meantime. When powder coating, the masking does not need to stay on the part the entire time in the oven. The part doesn't even need to remain masked when the part enters the oven. That leads to being able to use a lot more materials to mask your parts. If you want to learn more about masking and how to get crisp masking lines, go to Masking: Part II. Videos are definitely in the future plans. What kind of wheel masking? I have noticed one powder coater that masks the inside of a wheel where it meets the hub. Is there any benefit to why one might do that? I would think the exposed bare metal could begin to rust. Am I wrong? I believe the main reason is because the powder coat may not lay uniformly on the hub of the wheel which could cause a wobble in extreme circumstances. There is also an engineering rule that I have read before that I can't find at the moment that states that 2 bolted surfaces should be bare if they are torqued past a certain range. Wheels are definitely past that range. It is mostly for safety reasons in case of a worse case scenario. You will notice that wheel hubs from auto manufacturers and wheel companies are also left bare. Same with the hub that the wheel bolts onto. Most wheels are aluminum so they will not rust, but it is common for the hub to rust and stain the aluminum wheel hub. This will most likely happen if the hubs are not coated but it usually just cosmetic. In rare circumstances, the wheel will be stuck to the hub and will involve quite a bit of force for removal. I personally mask hubs off to avoid ever having safety issues concerning the wheel coming off. I understand. I will make sure I remember that. Thank you for the informative response. I just had the original rims to my '64 Impala powder coated, had new tires put on them and only one wheel will go back on the car properly. They went on perfect before, I am assuming the powder coating is preventing them from going all the way over the hub and drum tightly. How do I go about reducing the coating build up and not ruin the paint job on the rims...? Is the hub of the wheel coated? If so, I would just use some 220 sandpaper on a flat block to just sand the hub. Just be careful when you get closer to the actual metal of the wheel, you do not want to sand any metal off. I am currently coating as set of chrome wheels for myself. The wheels will be a chrome, gloss black and have dormant metallic green touches. The powders are cured at 370 degrees for 15 minutes after flow out. I am using hi temp green poly tape in 1/8, 1/4 and 1/2 inch sizes. When masking off the lines between color coating, I first use the 1/8 inch tape since it is easier to use around the wheel and leaves a smoother line. I then go over the part to be masked off with aluminum foil and the 1/4 inch tape which is slightly over laid over the 1/8 inch tape. The problem I am experiencing is the adhesive from the tape is leaving residue of the other color I am masking out. I've tired using different roles of tape and still experiencing the same problem. Do you know what is likely to be causing this problem and/or any suggestions on how to minimize/avoid this from happening? Thank you. I'm not sure if I fully understand when you say "the adhesive from the tape is leaving residue of the other color I am masking out". If you get a chance to reply, let me know very detailed what color you are using as your base, and what color you are spraying on top of it after masking it off. Also, if you could take some pictures of the issue and host them, just post the direct link in the comment section here, it doesn't have to be clickable, I can copy and paste. Without knowing exactly what you are experiencing, I would recommend that you pull the tape after flow out. This always gives much cleaner lines. Here are some step by step instruction, but I don't know the order of colors you are using. - Spray your base color, lets say gloss black. - Mask out everything you don't want coated, make sure to really rub down the tape, I use the handle of my scalpel and rub it over the tape after applying. - Spray your 2nd coat on the unmasked areas. - Put it in the oven at 200 degrees and let the wheel get up to temp. - Once the wheel reaches 200 degrees and the powder 2nd coat is cured enough to no longer be in a powder state, pull the wheel out of the oven and very carefully pull your tape. The best temperature to pull the tape is right around 180 degrees. If the wheel is too cold, the tape will pull leaving flakes, if it is too hot, it leave little strings of powder. Depending on how long it takes you to pull the tape, you may have to heat the wheel back up if you don't completely unmask it in time. I use a heat gun in one hand and the ir temp gun in the other hand to heat the areas I'm working back up to 180 and then continue pulling the tape. - After the wheel is completely unmasked, put the wheel back in the oven and finish out the cure. - Do the same for the remaining masked off areas, its a lengthy process but it is a night and day difference between leaving the tape on for the full cure. - After I am finished with all of the different coats, I like to bury the whole wheel in clear which evens out the ridge between the different coats. I hope that helps, if you are already pulling your tape, definitely comment back with pictures of the problem. Hi Can i ask regarding how to retap the standoffs at the metal working plate after powder coating. condition is there is sufficient place to use tap handle. To clean powder out of threaded holes, you can use the appropriately sized thread chaser. This will remove enough powder allowing the fastener to fit and will not damage the threads. Remember to use silicone plugs in any threaded holes to prevent having to do this though. That is why you should yous masking plugs, just avoid extra works due to imperfections. Save time, save money! Do you ever have a problem using a white base coat for two tone? Mine always yellows. White can yellow if it is over-cured. Make sure you are doing a partial cure on the white before you apply the next coat. You can also try to lower the oven temperature and extend the time. For example instead of 400 degrees F for 10 minutes, you can do 375 F for 15 minutes. Polyimide tape is another good masking tool as it has better properties than standard high temperature tape. It can go up to higher temperatures meaning its useful for more applications unlike high temp tape which wont work for certain pieces. Caution should be taken when powder coating threads. Hardware is designed with a specific K-Factor, which is basically a value for friction. This K-Factor is used to relate torque and clamp load. Critical joints ahould have threads left unpainted and recommended torques followed so the joint doesn't fail. Thanks for this! was the first hit on google and quickly answered the questions I had.. what tape to use to mask before powdercoating and what to use to cover weld studs. Thanks! You could use the green 3M Performance Automotive masking tape. 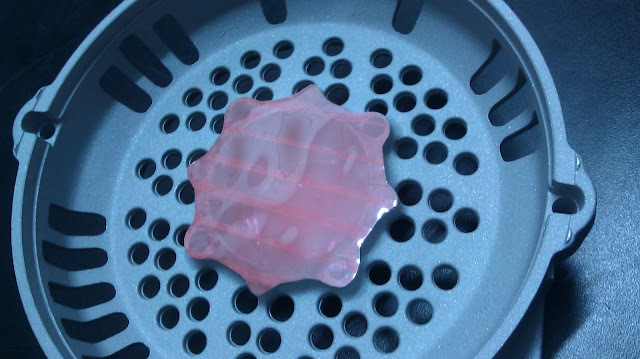 It is quite sticky and a more flexible than powder coating tape and will do okay in the oven till at least 250 degrees F. I would pull the wheels out of the oven at 200 and unmask, then finish the bake cycle. It does not cut as nice as high temp tape using a scalpel or exacto knife though. You may get away with it if you are masking on an edge, but if the masking line lies on a flat surface, high temp tape would be best. Also, another tip. Cleaning the area your masking with denatured alcohol prior to masking makes the tape stick quite a bit better. Give that a try as well. 1. After shooting the powder on a panel of bolt heads but before you cure them, unthread each bolt a couple of turns to break the powder connection from the bolt to the sheet. You can unthread the bolts from the back of the sheet so you don't disturb the powder on the bolt heads. Then stick them in the oven for the cure. This method should allow them to be removed from the sheet by hand (no tools needed). 2. Use a powder coat stripper to strip the sheets in between batches or at least when they get too much build up on them. I have never done 15,000 bolt batches but that would be my solution. Hopefully that helps. We run a lot of our hooks and racks through a burn off oven to burn off built up powder. I'm building a powder coating setup in my garage for coating aluminum R2D2 parts but I don't have enough room for a sandblaster. Assuming that I can sandblast in a different location and then transport the parts (say, in a closed plastic container), how long can I wait between blasting and powdercoating? And would it be better to clean right after blasting and then transport the parts, or blast, transport, and then clean right before coating? Or maybe clean both times (after blasting and right before powder coating). It is fine to have the parts blasted and transport them. Just make sure you transport them on a clean surface or like you said, in clean containers. Avoid touching them with your hands. You do not have much time between blasting and coating. Rust starts to occur instantly even if you can't see it, so the sooner the better. Anything longer than 12 hours and you can start to see visible rust depending on the humidity level. When you do your post-blast cleaning doesn't matter but for the sake of handling the parts without getting dust everywhere, you can blow the parts off right after blasting and do your final clean before coating. what would be the best masking to use to cover large areas, in sheet form? full metal, but needs coat on coatof different colours, with perfect lines between each colour. What would you recomened as away of doing this! I would recommend using a high-temp vinyl like Oracal 631. You can order rolls of it as big as you would like and it lifts cleanly as long as it doesn't go through a full curing cycle in the oven. I am designing 2-layer, stainless steel signage, and I want to powdercoat them. The top layer has Tabs which are bent down (at 90-degrees), and then go through rectangular slots in the face of the second layer. I don't want to mask these areas, as they are very visible, but what sort of allowances should I add to the slots, to ensure they'll accomodate both, the increase in tab thickness (including any corner rounding caused by the powdercoat), and the decrease in slot size caused by the powdercoat? Am I safe just assuming the thickness of the powdercoat in those areas will be the same as the face? Also, will it cause the rectangular slot to have rounded edges? or would it have the farraday cage effect and only thinly coat the inside edge? Can I control that effect by radiusing the rectangular slots? The average coating thickness for most powders is 2-3 mils (0.002"-0.003"). Since each side of the slot will be coated and each side of the tab, you should have about 0.012" of thickness due to the powder. 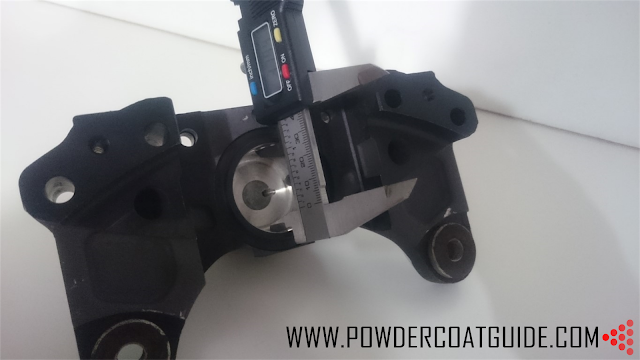 This is a very small amount and most likely you will not need to change the design to account for the powder thickness assuming that the tab fits into the slot with some slight tolerance. You also asked if there would be more powder thickness on the edges compared to the flat surface. This effect is called picture framing and it happens with some powders more than others. It usually is a very small difference in thickness as long as you are spraying the correct amount of powder on the part. If you see heavy buildup on the edges, this is a result of the powder being too thick. Radiusing the edges of the tabs and slots is not required but it will reduce the picture framing effect and the powder coat on the edges will be less prone to chipping.